The Canadian contingency on hand for Karisma Hotels & Resorts’ recent 10th Annual Gourmet Inclusive Vacation Consultant (GIVC) Awards – a four day event in Riviera Maya, Mexico celebrating top performing travel professionals from across North America – walked away with notable recognition. 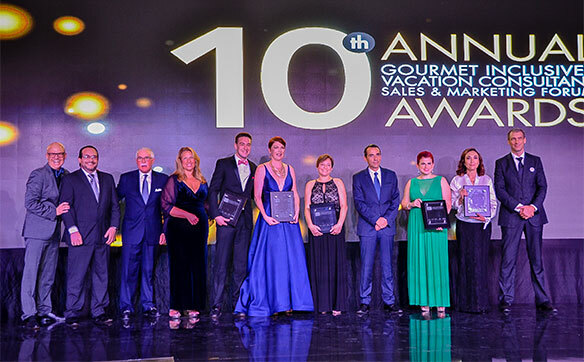 Along with a marketing and sales forum, educational workshops and themed soirees and parties, the festivities at the El Dorado Royale culminated with an awards gala and $250,000 in cash giveaways. In attendance for the eighth year in a row, Calgary-based Pamela Walker of Escapes.ca was one of only four agents to take home the Elite Award, given to those who produce over 2,000 room nights in one year. Another notable Canadian winner was Jen Langlois of Suite Trip Travel – TPI in Thorold, Ont., who was recognized as the Top Selling Storefront Canada agent for the second consecutive time. Meanwhile, Jennifer Cervoni of Vision Travel Solutions in London, Ont. says earning Diamond 4 status – for selling over 500 room nights in the last year – for the first time means a lot. In addition to earning Diamond 4 status, Cindy Almond of Romance and Foodie Travel in Ottawa was also recognized as a Top Wedding Producer for Nickelodeon. Alex Portman, senior business development manager, Canada for Karisma, says the GIVC program, which was launched in 2008, showcases how valuable the trade is for the company. Over the years, Portman says the number of Canadian agents taking part in GIVC has grown significantly. In terms of growth, Chomat reports Karisma Hotels & Resorts increased business in Canada by 30% while seeing a 50% increase from agents. In addition to bonuses, GIVC members receive access to marketing tools, added incentives to offer clients, exclusive deals, on-property VIP recognition, and more. “The main takeaway from the GIVC conference is the resort updates they provide on the new resorts coming, enhancements to their current brands and really the networking with other agents and suppliers,” says Langlois. After learning about some of the new additions coming online as the company moves ahead with plans double its portfolio within the next four years, from Margaritaville-branded hotels throughout the Caribbean and Mexico to three new resorts in the Cap Cana area in the Dominican Republic to an expansion into Huatulco and beyond, Walker says the potential to increase sales will only continue. “I look forward to selling Karisma in new destinations in the coming years,” she says. For Almond, a major takeaway of the annual conference is bonding with fellow agents. How can agents increase their Karisma bookings?